Before the Arctic National Wildlife Refuge existed, the northeast corner of Alaska drew scientists' interest with a resource more obvious than oil-the ice held within the mountains high above the coastal plain. 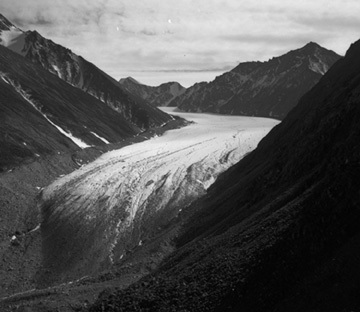 photo of McCall Glacier in 1958. In 1958, glaciologist Austin Post took a snapshot of McCall Glacier, one of a handful of Brooks Range glaciers, and stored the negatives from his trip in a shoebox. 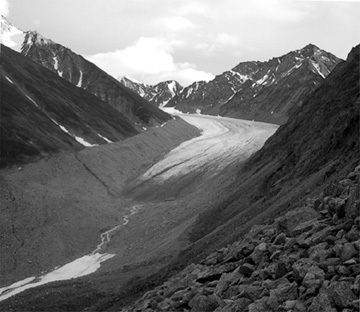 In 2003, Matt Nolan printed Post's photo of McCall Glacier and carried it on a trip north. After landing on the glacier and setting up a base camp, Nolan, an associate research professor at UAF's Water and Environmental Research Center, hiked for six hours up side drainages until he found the same spot where Post stood. Nolan took a shot with his tiny digital camera and captured a solid argument for climate change in the Arctic. When compared to Post's photo, Nolan's shows an impressive ice loss in the 45 years that elapsed between clicks of the shutter. "Something's changed, climate-wise, that you can't argue with," Nolan said. "Either less snow fell or more melting happened over the past hundred years or so." The hows and whys of McCall Glacier's retreat are some of the things Nolan and his colleagues are studying during trips to the glacier that began in 2003 and will last until 2007. Nolan hopes McCall and other Brooks Range glaciers will reveal secrets of the past 150 years of climate change in Alaska's arctic. Brooks Range glaciers make up a tiny fraction of Alaska's thousands of glaciers. Mostly clustered in the extreme northeast where the Brooks Range bends toward the Arctic Ocean, the glaciers receive much less snow then their southern counterparts. Because the area is so cold, the glaciers survive because they also lose less snow to summer melting than the ice bodies on Alaska's southern coast and interior mountains. McCall Glacier is among the largest of the Brooks Range glaciers but is still small enough that a person can walk from its high point at about 8,000 feet to the tip of its terminal tongue and back in a day. That's tiny compared to some coastal glaciers like Malaspina, which is larger than some eastern states. location and snapped this photo. The first major scientific mission to McCall Glacier was during the International Geophysical Year of 1957-1958, when different research organizations from all over the world agreed to focus on Earth science projects, many of them in Alaska. Another mission to McCall Glacier from 1969 to 1972 yielded valuable measurements of the glacier's profile. Some of the ice measured then has disappeared, signaling the retreat of the glacier. Nolan and his colleagues use some of the information gathered from the earlier scientists to help calculate the volume of ice loss shown in the photos. Because present-day researchers also have the use of high-powered helicopters, in 2004 they removed by slingload about two tons of gear and supplies left by previous expeditions. The National Science Foundation and the U.S. Fish and Wildlife Service helped with the glacier cleanup. For all the ice cores, snow pits and data from weather stations Nolan and others extract, dig, and otherwise gather from McCall Glacier in the next few years, he said the photo he took on that August afternoon while he stood in the same spot Austin Post had 45 years earlier will probably be the most enduring element. "That will probably be the most valuable thing, something that anyone can understand," he said. "Photos don't lie." This column is provided as a public service by the Geophysical Institute, University of Alaska Fairbanks, in cooperation with the UAF research community. Ned Rozell (e-mail) is a science writer at the institute.